Cut to the Britten Studio at Snape on Saturday evening (Jan 21) where the 'Returns Only' sign was posted at the box office. So what sold out this remote venue in the middle of January - a pop-up concert by Gustavo Dudamel and his Simón Bolívar band perhaps? Well actually no, the event was an exploration of symmetry presented as part of Aldeburgh Music's Faster Than Sound experimental series. A major factor in the box office appeal was that Marcus du Sautoy was animating the event - author of several best selling books and a frequent TV presenter, his day jobs are Simonyi Professor for the Public Understanding of Science, Professor of Mathematics at the University of Oxford and Fellow of New College. 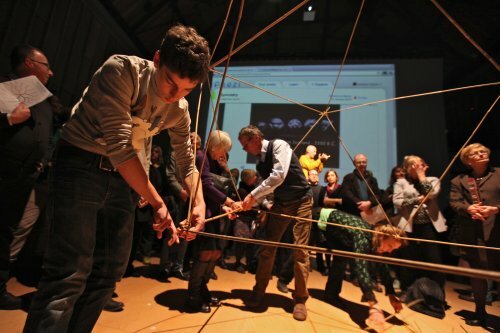 Marcus du Sautoy was leading an exploration of symmetry in mathematics, design and music supported by a graphic designer, a multi-disciplinary artist and a multi-sensory artists collective. This Oxford professor of mathematics is also no slouch when it comes to music - he plays the trumpet and his unscripted deconstruction of the Goldberg Variations put many professional musicians to shame. His symmetrical soundtrack included Iannis Xenakis' Nomos Alpha and Olivier Messiaen's Quatre études de rythme Île de feu 2 in quadraphonic diffusions and a sequenced version of Bach's Goldberg Variations performed on MIDI Piano and Mac mini. All the photos were taken at Symmetry and the central figure in several of them is Marcus du Sautoy. Symmetry sold out against the odds and Marcus du Sautoy kept his audience captivated for two hours. So someone, somewhere was doing something right. This was not a conventional live music performance and there is no suggestion that Symmetry can provide a template for the future of classical music. But it can provide some pointers to innovative ways of connecting with that elusive new audience, and where better to start than challenging conventions? 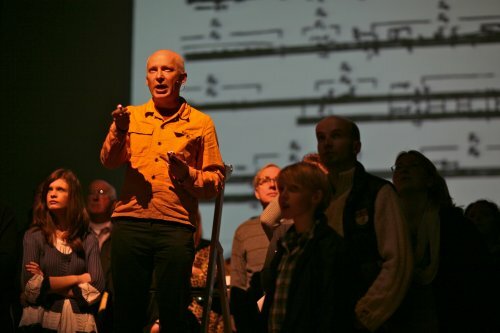 Jonathan Harvey famously proposed that classical music should drop its silly conventions and Symmetry confirmed that we should be far more willing to experiment - and sometimes fail - with new concert formats. 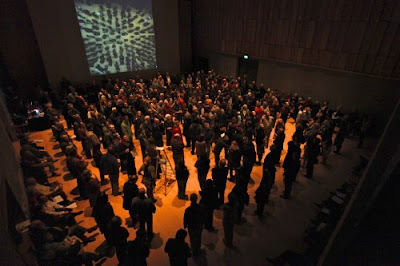 Allowing the audience to move around during the performance was one of Jonathan Harvey's suggestions. Symmetry was not a live music performance, but I was impressed by how well the no seats Top Gear-style format (hate the programme but let's learn from it) worked in the Britten Studio - see accompanying photos. In the 1970s the seats in Philharmonic Hall in New York were replaced by red rugs and foam cushions, with Pierre Boulez explaining in a pre-echo of Jonathan Harvey "There is so much formality involved in the performance of music that we make it hard for audiences to get emotionally involved." More recently experiments such as Gabriel Prokofiev's classical club nights have dispensed with that formality - we need others to follow their lead. Overturning established intermediaries was the second pointer from Symmetry. Even in these financially troubled times a not inconsiderable number of middle feeders - agents, impressarios, PR consultants, media companies etc - are making a very comfortable living from classical music. Any change threatens that comfortable living, which is why established intermediaries pay lip service to change while actually resisting it. Credits for Symmetry include graphic designer Richard Rhys, multidisciplinary artist Russell Haswell, visuals and electronics facilitator Farmersmanual, which describes itself as 'a pan-European, multi-sensory artists' collective that presents a stream of events from concerts to interdisciplinary cultural, aesthetic and political experiments', and co-producer Lumin, which creates 'sound led experiments across art forms'. Those are not names you find in the average concert programme - which is a pity. The third pointer from Symmetry was the power of the visual. This is a familiar theme On An Overgrown Path and Saturday evening reinforced the point that a spoonful of images helps difficult music go down. Big screen organ recitals are popular with audiences, so why not big screen symphony concerts? And that could just be the starting point - at Snape Russell Haswell's oscilloscope images created by real time sound spectrum analysis gave a taster of the further possibilities. Another pointer from the event was how a really good presenter never talks down to his audience. 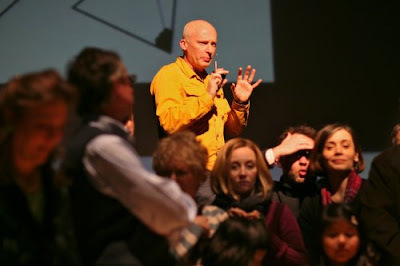 Marcus du Sautoy stretched his audience - which had one of the widest age ranges I have seen at Snape - and took them with him all the way to Xenakis' Nomos Alpha without once talking down. If you need any more convincing watch this video. In comments about the decline of classical radio a number of readers complained about how the current generation of radio presenters talks down to their audience. 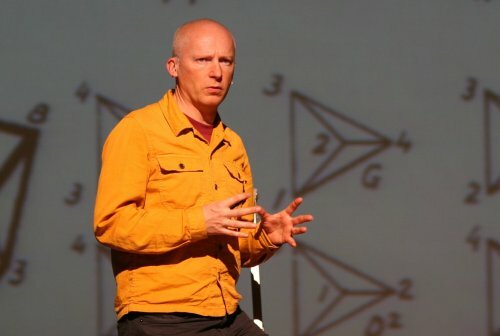 Marcus du Sautoy handed out work sheets for the audience to complete in the intermission with the explanation that "mathematics is not a spectator sport". We could well adopt "Classical music is not a spectator sport" as a new battle cry because many of the genres current problems are caused by futile attempts to repackage it as a passive entertainment rather than an active experience. The key role of the animateur - the final pointer from Symmetry - is also a familiar theme here. Seeing Marcus du Sautoy in action brought home just how lamentable BBC Radio 3's current crop of imported Classic FM presenters really are. Marcus du Sautoy may not come cheap, but ex-Classic FM 'face of the BBC Proms' Katie Derham comes at a reported annual cost of £250,000 - and still the ratings go down. Symmetry was all about seeing things from a different perspective. So, in conclusion, here is a suggestion for an experiment that might just engage with a new audience. Send Katie Derham back to reading the news, recruit Marcus du Sautoy to present the Proms on BBC Radio and TV, and hire Farmersmanual, Lumin et al to give the Proms concerts a much needed makeover. I have a feeling the result would not be spectator sport. * More on the Britten Studio in Playing in new music's sandbox. Photos are by Jana Chiellino and come via Aldeburgh Music, whose indefatigable Marc Ernesti receives my thanks for finding me a complimentary ticket for the sold out event. All views expressed here are, of course, my own. Report broken links, missing images and errors to - overgrownpath at hotmail dot co dot uk Also on Facebook and Twitter.